In Short: THE AMBLER WARNING opens at a clandestine psychiatric facility on a restricted-access island just off the coast of Virginia, within spitting distance of Langley. The facility ostensibly treats intelligence agents who may know too much or who are too dangerous to leave wandering among the general populace. One of these patients is Hal Ambler, who is kept heavily medicated and guarded at all times. When a hospital worker helps him escape, Ambler doesn't think twice before jumping, and almost immediately reverts to form in utilizing the training and skills that ultimately got him hospitalized in the first place. Ambler's immediate goal is to determine who caused him to be hospitalized, and why. There's one problem, however: Ambler does not exist. There is no record of him anywhere. Worse, when he looks in the mirror, he doesn't recognize the man he sees looking back. What Ambler does uncover, though, is that someone is attempting to frame him for the murders of foreign heads of state, with a most significant one being ready to occur within a rather short period of time. Ambler, with the might and majesty of the U.S. intelligence service hunting him, finds a couple of unlikely allies, including an agency number-cruncher who is able to extrapolate conclusions from raw data with extremely accurate results. 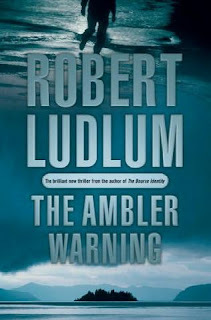 THE AMBLER WARNING comes at a time, when a lot of Hollywood flicks have been made based on Ludlum stories. The novels kicks off the suspense from Page2 itself and the relentless action continues to the last pages. The principle character Hal Ambler's failure to understand "Who he is or was" and the constant failure to connect to his past remains the bedrock of the novel. He often ends up saying "Madness...Complete Madness"
However, the Chinese backdrop seems to be the renewed interest of authors after the chilling cold war. What I particularly liked in the novel and which makes it immensely a must-read is the special gift of Hal Ambler to read people, he is virtually a walking lie-detector, and his interesting vibes on people walking on the busy street and among which he could point out a waiting assassin makes him an interesting character for the novel.